One of the largest portable generators available, the rugged, professional grade XP10000E offers premium features that make it ideal for job sites and day long events. 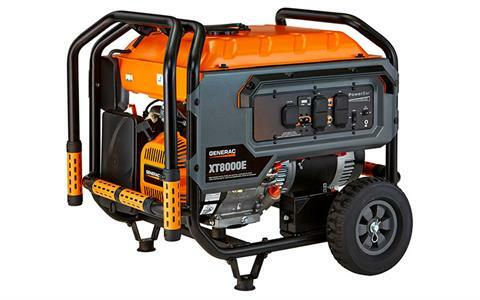 THE GENERAC OHV ENGINE: With splash lubrication provides a long engine life. IDLE CONTROL: Reduces noise and conserves fuel for extended run times. LOW-OIL LEVEL SHUTDOWN: Automatically safeguards engine from damage. POWERBAR™: Easily monitors power usage. HOUR METER: Tracks usage and monitors maintenance cycles. LARGE-CAPACITY STEEL FUEL TANK: With incorporated fuel gauge provides durability and extended run times. FULL WRAP, HEAVY-DUTY, 1 ¼ IN. STEEL TUBE CRADLE: For added durability and strength. ALL-TERRAIN, NEVER FLAT WHEELS AND FOLD-DOWN LOCKING HANDLE: For reliable portability and compact storage. SINGLE TOUCH ELECTRIC START: Provides hassle-free start-up, battery included. On-control panel plug-in battery charger jack keeps battery charged. 20 FT. CORD INCLUDED: Use the four outlet cord to plug in more. CONTROLGUARD™: Provides added protection to the control panel. Run Time @ 50% - 11 hr.